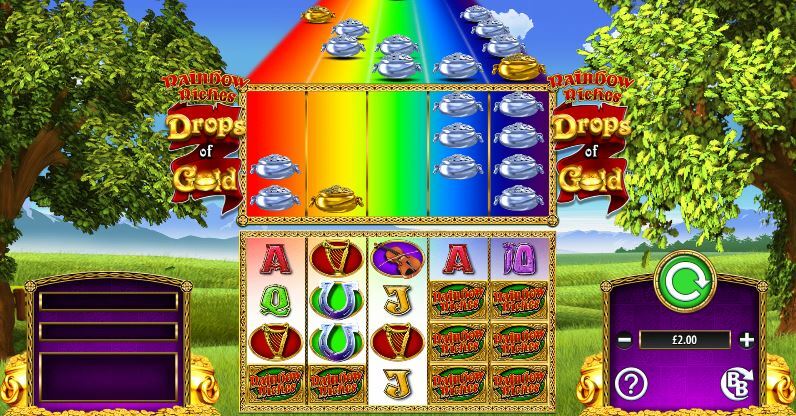 Anybody raring to enjoy a fantastic slot game with intriguing bonus features needs to try Rainbow Riches: Drops of Gold. This amazing game is brought to us by the innovative minds at Barcrest and is available now to play at Slot Shack. If you have played any of the other Rainbow Riches games, you are bound to love this latest instalment to the series. Drops of Gold is set amongst a veritable paradise that has had no details spared. Clouds below across the sky and the leaves wave in the breeze as you prepare to follow the brightly coloured rainbow of an upper reel on a quest for that big win. The symbols are always one of the best parts of a slot game. Here, you have a happy red and white mushroom, an elegant cláirseach, a melodic fiddle, and the Rainbow Riches tile. Every now and then, you might also spy a rainbow Bonus tile or a Drops of Gold banner, both of which have exciting roles to play in the bonus features. On the upper reel, you will be able to see some silver and gold pots. They do indeed contain riches untold, for if you can make them drop to the lower reel, they will transform into amazing rainbow wilds. This game initially appears quite complicated, but it is important to remember that at its heart it is still a slot game. If you keep your attention focused on the lower reel for the first few rounds, the best tactics are sure to click into place if you know your way around a slot. To play, all you need to do is place a bet and hit the spin! Your bet can be altered at the panel the right of the reels. Here, you can also find the paytable and the access to the Big Bet game feature. The panel to the left of the game screen tells you how many of the paylines you have won on and exactly how much your win is worth. Drops of Gold is stuffed with special features which are bound to keep you entertained for hours. The eponymous feature is perhaps the easiest to trigger. Whenever the Drops of Gold banner appears after a spin, the pots in the upper reel drop down to the lower and undergo their transformations into those lucrative wilds. With the golden pots able to become any symbol including the bonuses, this feature is sure to earn you some cash. There is also a fantastic free spin feature available. Simply match 3 or more bonus tiles and you are away with 8 free spins under your belt! Land another bonus tile? Take another 4 free spins! These are all great features and there is one to top everything off. The Big Bet feature gives you 3 different scenarios and 5 spins to see if you can land a win. With the luck of the Irish on your side, you are sure to land your own pot of gold. Best for either experienced slot players or someone searching for more of a challenge, Drops of Gold is sure to have you finding the treasure at the end of its rainbow.